Journal Semiconductor Physics, Quantum Electronics and Optoelectronics issued quarterly, 4 times per year. Certificate of State registration of print media KB № 4350 of 04.07.2000. Journal publishes pegular papers, short letters and reviews on Physics of interaction of electromagnetic radiation with semiconductors and dielectrics, properties of hetero- and low dimensional structures, physical basics of sensorics. As well it presents lectures, presentations etc. for subscribers only. ISSN 1560-8034 (Print), ISSN 1605-6582 (Online). You can order subscription through "UkrInformNauka" or electronic version of SPQEO through subscription agency DP "Presa" on site (subscription indexes 60675 or 60676) or by sending invoice. 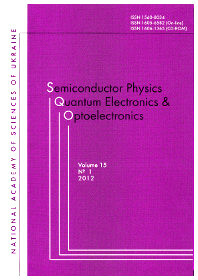 There are two options for ordering journal Semiconductor Physics, Quantum Electronics and Optoelectronics: full price (# 60675 in catalogue of DP "Presa", invoice in USD, invoice in EURO, invoice in UAH) and reduced price for students and Ph.D. students (# 60676 in catalogue of DP "Presa", invoice in USD, invoice in EURO, invoice in UAH).